It was weird being in Germany. My dad used to speak some German around the house, mostly jokes that didn’t translate well. There’s a joke that one of the smallest books in the world is The Big Book of German Humour. But being in Berlin almost felt like coming home. I understood a lot of the signs and picked up on the jist of some overheard conversations. The one thing I didn’t get was the German love of ice cream. I missed that gene. Touching the remnants of The Wall, driving through the city in Trebants, visiting the Brandenburg Gate all resonated. The Holocaust Memorial brought tears to my eyes. Moscow was wonderful. We stayed in the National Hotel, across the street from the Kremlin. Lenin had an apartment there before he moved into new digs at the center of power. We could see the onion domes of St. Basil’s as we brunched on blini and sausages. I loved the people, gruff but with a twinkle in their eyes. I loved their subway system. The stations were cavernous with marble and chandeliers and brass statues passengers would rub for luck-especially the shoes of the children and paws and muzzles of the dogs. At the space museum, we saw taxidermied versions of Belka and Strelka, the first two cosmodogs who returned safely home. They were launched aboard Sputnik 5 fifty-five years ago today. All I could think about was our dog Sponge who hated going too far on her walks and would tug on the leash to run home where it was safe. In both cities, I loved seeing history come to life and I include little details in my novels, hoping to help the reader immerse themselves in a foreign culture. 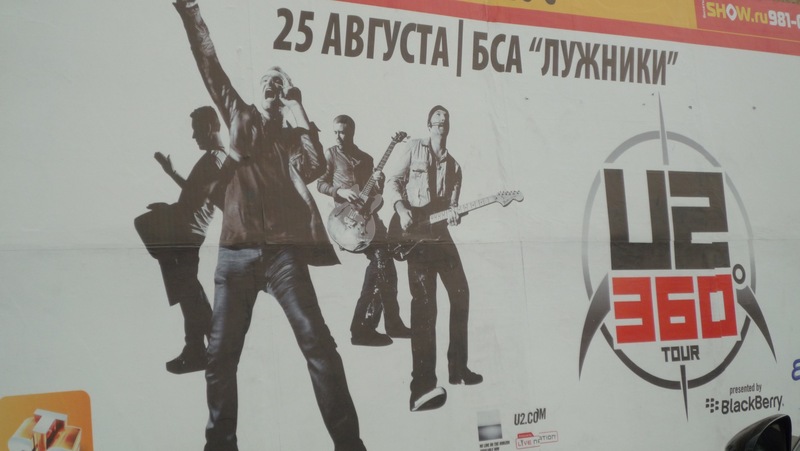 The excuse for the trip was to see U2 and Snow Patrol play Luzhniki Stadium. It poured. I mean buckets. We didn’t care. It was so cool to see everybody enjoying the music. At the end of the night we took the subway home. Thousands of soldiers funnelled people from the stadium to the nearest station, standing shoulder to shoulder. They looked so young, many with the blush of adolescent acne. I couldn’t help thinking not so many years earlier these people were the enemy; these young kids would have been fighting our young kids in a war that would have decimated the planet. Time and distance gives perspective. That’s why I travel; so I can get perspective and observe my life through a rearview mirror. Screw Publishers! Fans Call The Shots!